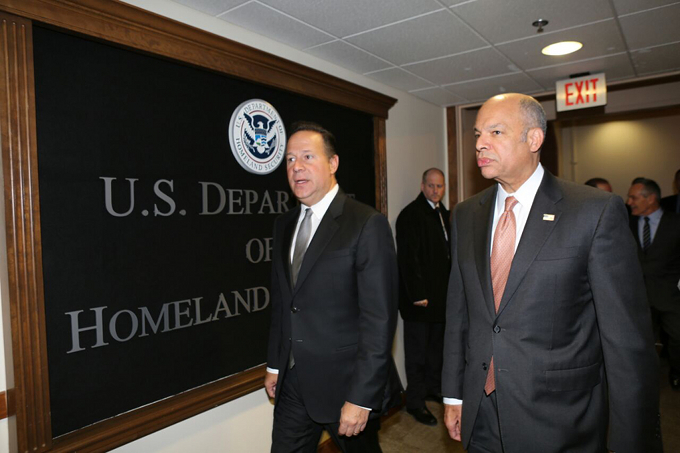 Grim scene: Panama’s President Juan Carlos Varela at the US Department of Homeland Security, as US moves against members of the Waked family and some 70 businesses of theirs were unfolding. Photo by the Presidencia. President Juan Carlos Varela’s address at the Council of the Americas attempted to jawbone his way through the country’s growing political instability. Polls show nearly 80 percent of Panamanians no longer believe anything his government says. Yet, in a reality disconnect, the president used his favorite buzzword (“transparency”) a total of seven times. But not once about actually putting it into practice. And although “actions speak louder than words,” he has not issued any executive regulations to ensure information in the public interest is distributed widely, rather than to media selected to ensure the less flattering bits are glossed over (in exchange for access). Varela’s lack of political will on transparency is worse even, than a management style that might only charitably be described as sloth-like. Case in point. Despite a reference evidently for export-only, about the rule of law and “an overriding commitment to transparency and accountability in the use of public funds,” Mr. Varela has yet to have his minister for canal affairs report to the National Assembly floor regarding the canal expansion, as mandated by a 2006 law still on the books. Nor has the contract for such works ever been made available for public inspection — as provided for by the Transparency Law (formally) en force. Similar fiction involves “investing the public funds with transparency to ensure the access to drinking water, basic sanitation, decent housing, education, healthcare and transportation” which is belied in a country (quite literally) falling apart. Last, but certainly not least, regarding omissions: while in Washington, Mr. Varela not once made a fleeting reference to the lack of level playing fields that lie at the heart of the offsore tax evasion controversy (which is sure to flare up — again — on Monday, with Suddeutsche’s announced second dump). Interest might well be growing hard by the Beltway, in Delaware, and further afield, in Nevada and Wyoming, The president might have defused revelations that the Mossack Fonseca & Co (BVI) Ltd. had suffered “an administrative penalty in the amount of $37,500” for “failing to carry out the necessary enhanced customer due diligence measures in respect of a high risk customer as required.” And, as the Guardian had it: “For the last 10 years, the analysis suggests, the BVI has been licensing the firm even though it knew it was not fulfilling its legal obligations.” Probity would have presumed that background checks carried out prior to one of the principals’ elevation to the Panamanian cabinet on July 14, 2014 would have brought these references to light — or did they? Preaching to the choir at the Rockefeller Foundation-sponsored event doubling as powwow highlighting energy development on the subcontinent, Mr. Varela heralded a forthcoming AES (“The power of being global”) methane plant in downtown Colon. But he “forgot” to praise a coal-fired generator at a Canadian open-pit copper mine smack in the middle of the Central American Biological Corridor further up the coast (of the type the World Bank decries as “a disaster for the planet”). Praise was also heaped on the 100-strong regional multinational headquarters program, which houses the families of expatriate managers working in currently-troubled parts of northern South America — hardly the stuff of sustainable development. Our airline hub is what makes the above possible. Yet once COPA went public on the NY Stock Exchange, some 80 percent of its benefits are siphoned out of Panama — with little hope that they will return. A country lacking a central bank and its own monetary policy is ever walking on eggshells. Leadership and confidence is indispensable in such scenarios.